' M�ritz', a magnificent region with hundreds of small and large lakes in an undulating landscape with large forests and marshes. The region is famous for its breeding birds like Crane, White-tailed Eagle, Osprey and many more. After the German Wall fell down there was founded a large National Parc. Near the Parc-Centre in the hamlet of Speck stands this beautiful old Lime-tree, wich is thought to be about 500 - 600 years old. Nearby lots of old Oaks can be found as well. 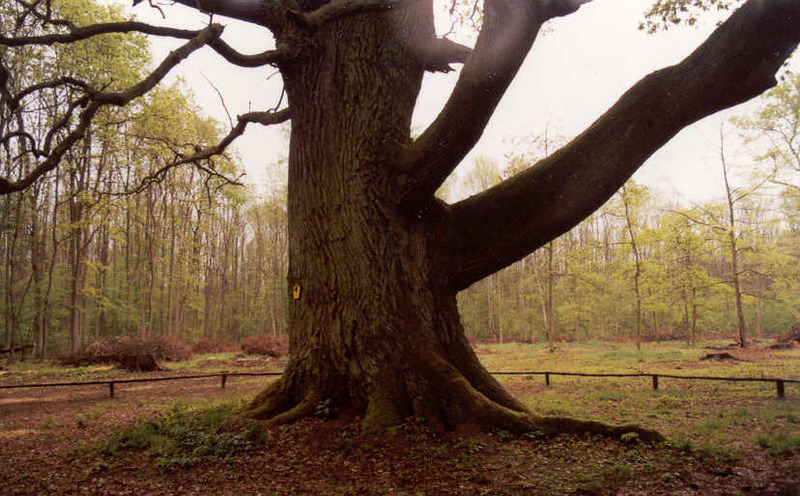 To the West of the great M�ritz - lake near the village Minzow this enormous Oak can be found: in Mecklenburg only the great Ivenack-Oak is bigger. Its name means in local dialect ' Crane-Oak ' : indeed there are many Cranes breeding and on migration in the region, but they rarely sit in trees. 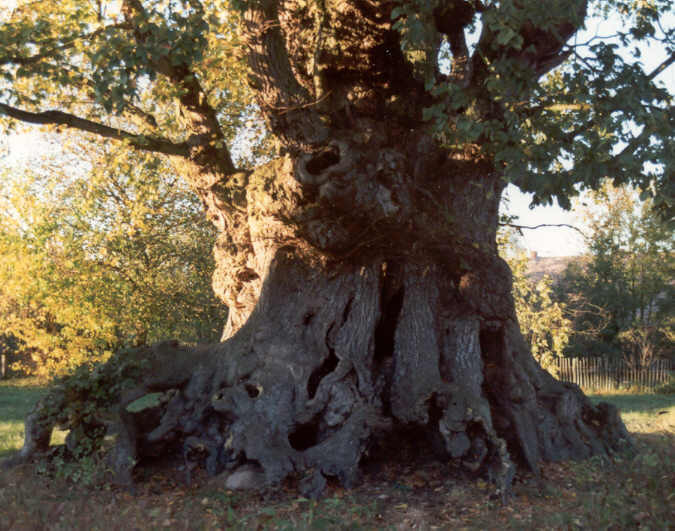 The oak has a girth of 9,6 m (nearly 32 feet) and must be about 500 to 700 years old. To the North of the M�ritz, at the side of the lake of Malchin, lies the village Rothenmoor. In the splendid surroundings again many old oaks can be seen. 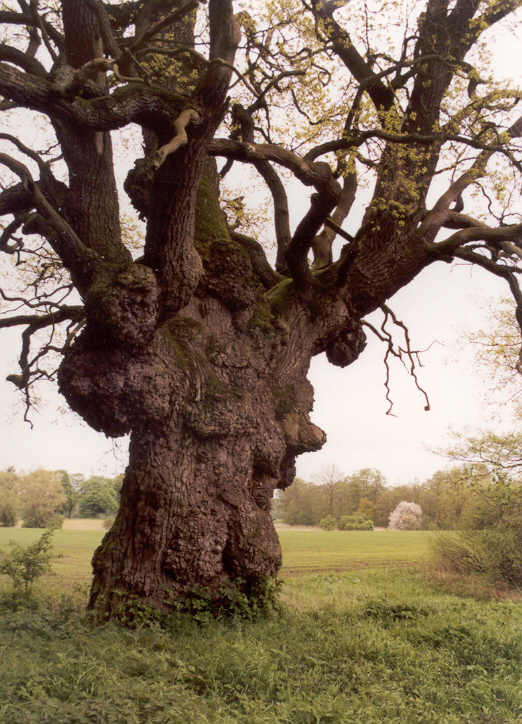 The 'Knorr-Eiche' (meaning knotty-oak or gnarled oak) is very picturesce with its many faces grinning upon the visitor ! The 'Knorr-eiche' shows just as many heads at the other side. In the same region, between Ivenack and the M�ritz, hidden in a swampy forest, stands the ' Vosseik' , an impressive giant. Less old than the Oaks of Ivenack or the above Kroneiche, it is the huge crown with enormous branches wich make this oak very special. It is rather hard to find in the swampforest, walking along muddy paths with a lot of musquitos but it is worth-while. The tree has a height of 34 m (112 feet) , the greatest spread is 38 meters ( 125 feet) and the girth 8 m ( over 26 feet). 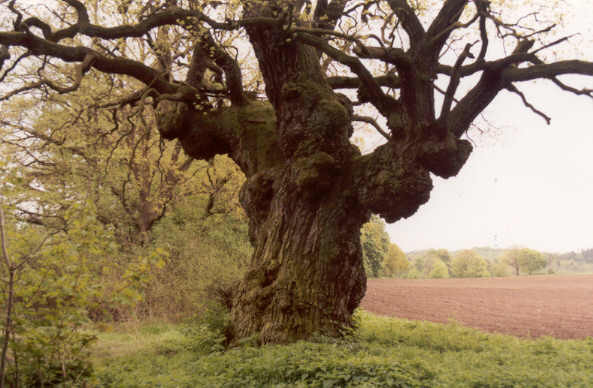 The Oak stands on fertile ground and is probably about 400 or at most 500 years old. Under the trunk is a fox-hole, in Dutch and dialect-German "vos" means fox. Somewhat to the South-west from the M�ritz, in the village of G�litz , one of the last ancient Elm-trees of Germany can be seen. It is a White Elm, Ulmus laevis, a native species over a large part of Europe including Britain and Ireland. 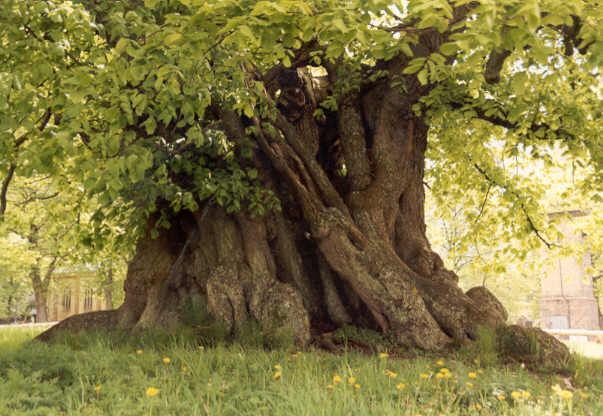 It is probably the biggest and oldest elm of Germany and perhaps even of Europe. The white elm is less susceptible to Dutch elm desease than most other elmspecies. 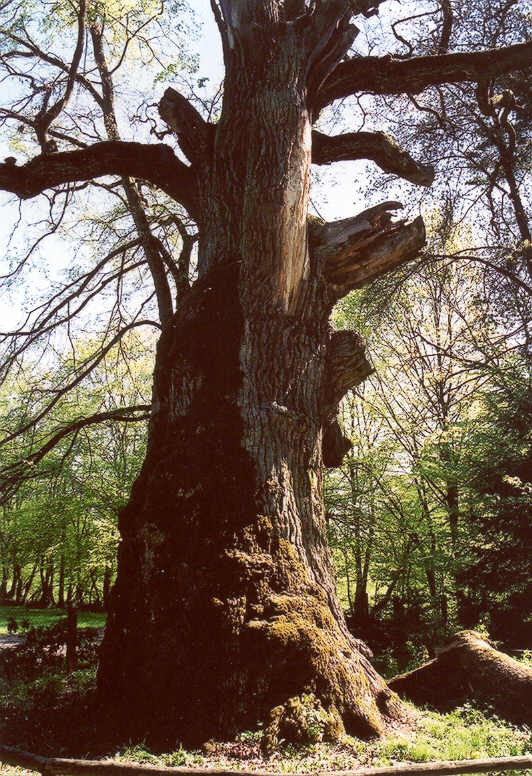 Most large elms have died because of the 'Dutch-elm-disease' , although in this region in Germany there can be seen some more old specimens. The tree has a circumference of 9,7 m (32 feet) and is probably over 500 years old. On the Elm - page you can see more of these beautiful species.